Can analytics really capture the essence of a game? Can performance on the court be reflected by numbers or even graphics? The statistics for last night’s men’s basketball game against Charleston Southern tell quite a tale. Indeed, any way you slice the data, the Cats were red hot on the court in their game against Charleston Southern. More seriously, here is the heat map for the shots taken beyond the arc where a red marker indicates a made 3-pointer shot and blue is a missed shot. 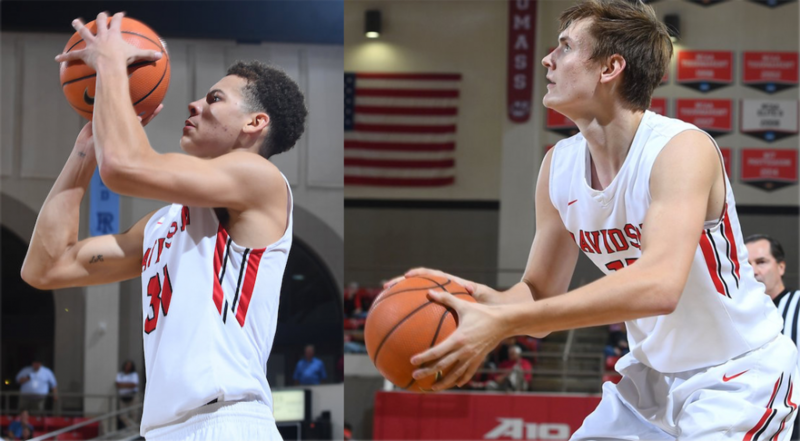 The team shot 26 3-pointers in the game setting a new A-10 record with Oskar Michelsen contributing 6 of 9 and Kellan Grady making 7 of 10 from behind the arc. The NCAA record set in 1994 is 28 in game between Troy and George Mason when 74 total 3-point attempts were made. 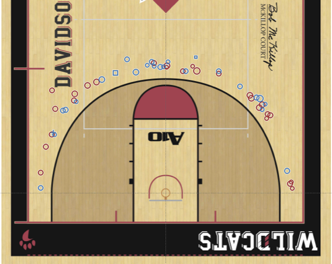 Note, Davidson reached 26 3-pointers with only 53 attempts and they made 3-pointers at just under 60% in the first half. The team made over half of their 2-point shots, too. Now, how much better was this than the previous record? Let’s look at the performance side by side. As we saw last night, we hit 26. The previous A-10 record was set by the Wildcats in 2015 (and St. Joe’s in 2004) and was 20. It’s quite a jump, which we see above. While the shooting might make the Cats go wild, be sure to look at the whole box score. The Wildcats also had 29 assists with only one turnover – that ratio set another record for the Wildcats. We saw two records fall last night and we are 1 game into the season. It’s a great day to be a Wildcat as the Cats are wild!